Hi I am sure everyone has enjoyed this summer so far. I know I have kept busy and haven't been writing much. Time to play catch up. Last time I wrote I did not include that I had entered Nordic Needle's Hardanger Design Contest. It was my second entry and I managed a Honourable Mention. I was very proud. I created a needle case. Today, they returned the needle case with a copy of my write up that is in the book and a rosette. 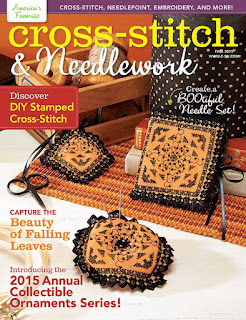 Cross Stitch and Needlework magazine have posted a few photos of the Fall 2015 issue. I made the cover. In the spring, they asked to do an article on me, so that is also in there. it comes out soon. Can't wait to see it in print! Thank-you for reply. I don't think I phrased my question very well. The pattern I was looking for was the sewing case with the Hardanger Heart on it. Is that pattern for sale? The needlecase is in Nordic Needle's Hardanger designs booklet that came out in July. Roz has done a nice job with instructions and chart. I would contact them.